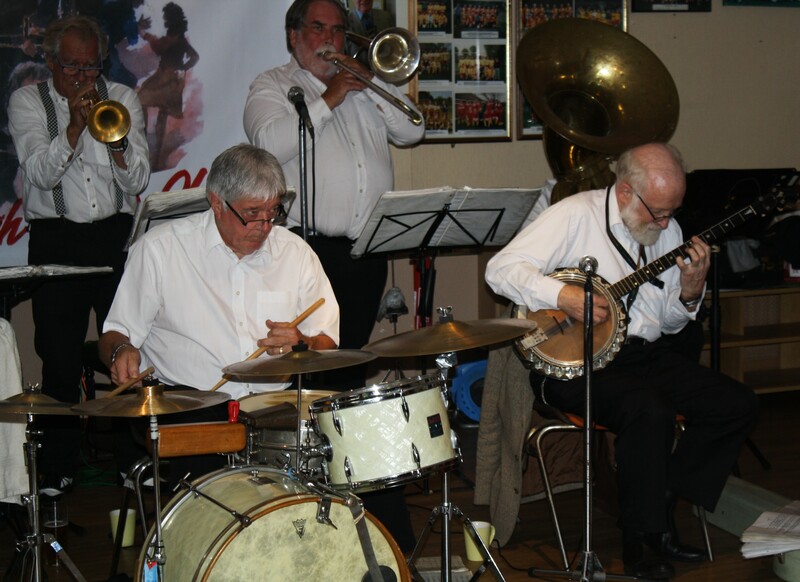 “Sweet, sweet jazz, all night long, that was what we heard from the amazing ‘YERBA BUENA CELEBRATION JAZZ BAND’. I don’t think there was a moment when the place wasn’t buzzing. 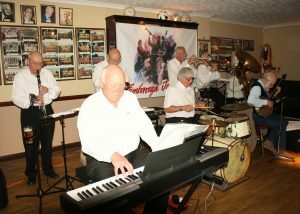 Every number they played was fabulous and with dancers galore out on the floor, everyone enjoying the fabulous tempos. 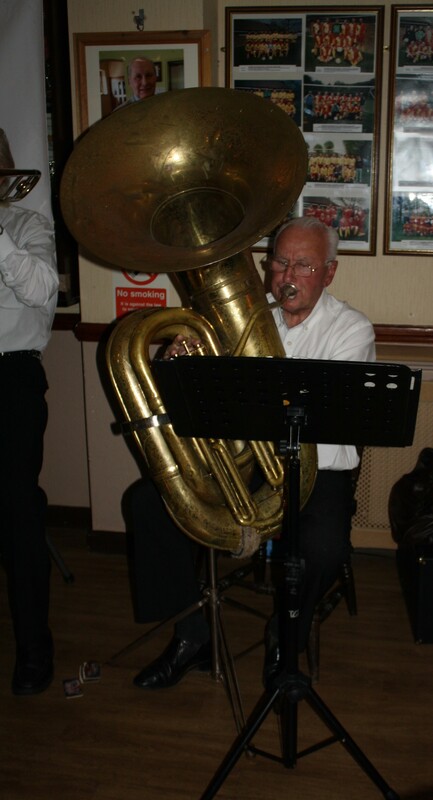 Probably my most memorable number was that great tune, ‘Ring Dem Bells’ (composed by Duke Ellington in 1930)”. 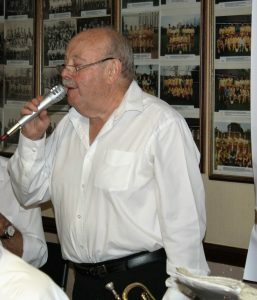 These were my words describing the night they played for us on 20th May 2011 – my write-up for their next visit on 7th October 2011, has unfortunately been trapped in a ‘frozen’ computer. 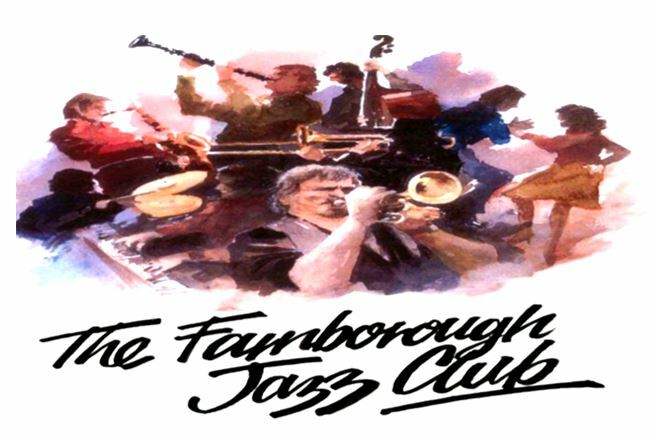 I thought the above write-up would impress you enough, to encourage many of you to turn up for our Friday, 26th June 2015 evening and enjoy their talents again at Farnborough Jazz Club. 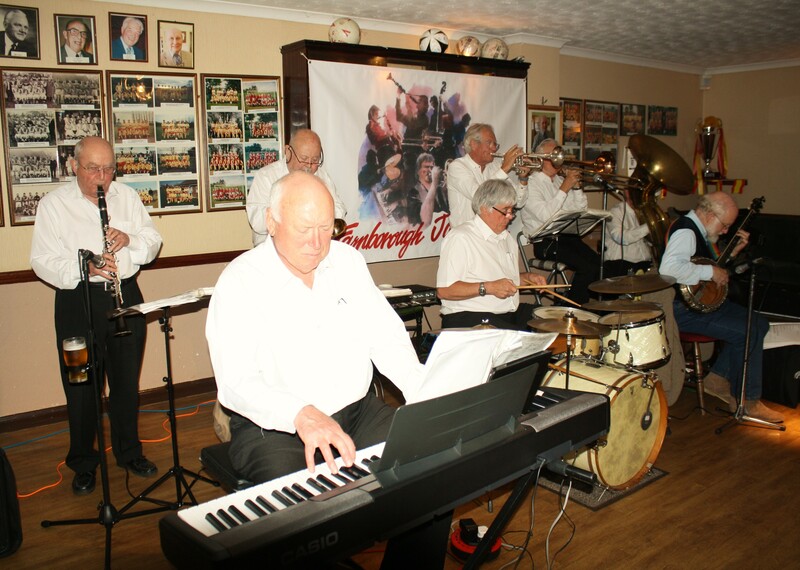 The musicians were DAVE RANCE – band leader, vocals &1st trumpet, MIKE BARRY – vocals &2nd trumpet, GOFF DUBBER – clarinet, GRAHAM WISEMAN – trombone, HUGH CROZIER – piano, PETE LAY – drums, JOHN ARTHY – tuba and NICK SINGER – banjo. 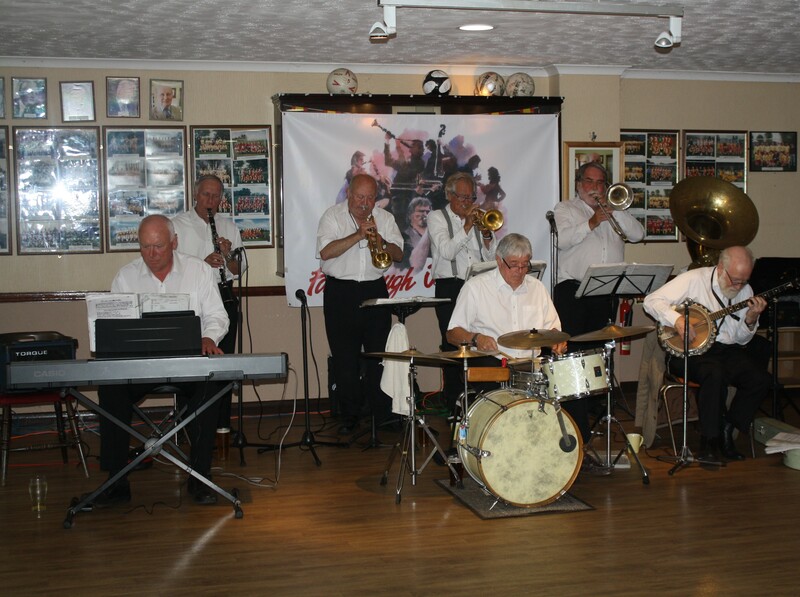 Yerba Buena Celebration Jazz Band seen here at Farnborough Jazz Club (Kent) on 26th June 2016. (LtoR) Hugh Crozier (piano), Goff Dubber (clarinet), Mike Barry (2nd trumpet &vocals), Dave Rance (1st trumpet &vocals), Pete Lay (drums), Graham Wiseman (trombone), John Arthy (tuba) and Nick Singer (banjo). 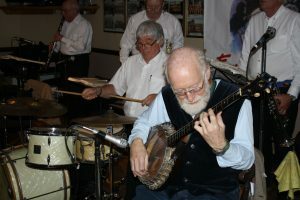 Photo by Mike Witt. 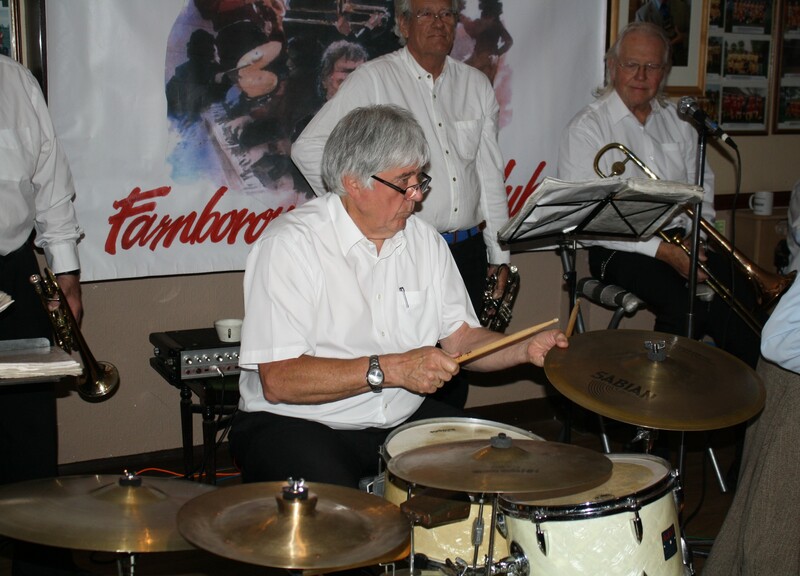 Yerba Beuna Celebration JBYerba Buena Celebration Jazz Band seen here at Farnborough Jazz Club (Kent) on 26th June 2016. 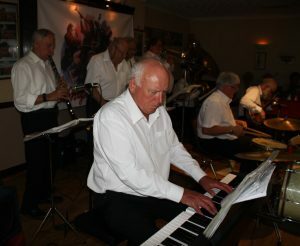 (LtoR) Hugh Crozier (piano), Goff Dubber (clarinet), Pete Lay (drums), Mike Barry (2nd trumpet &vocals), Dave Rance (1st trumpet &vocals). 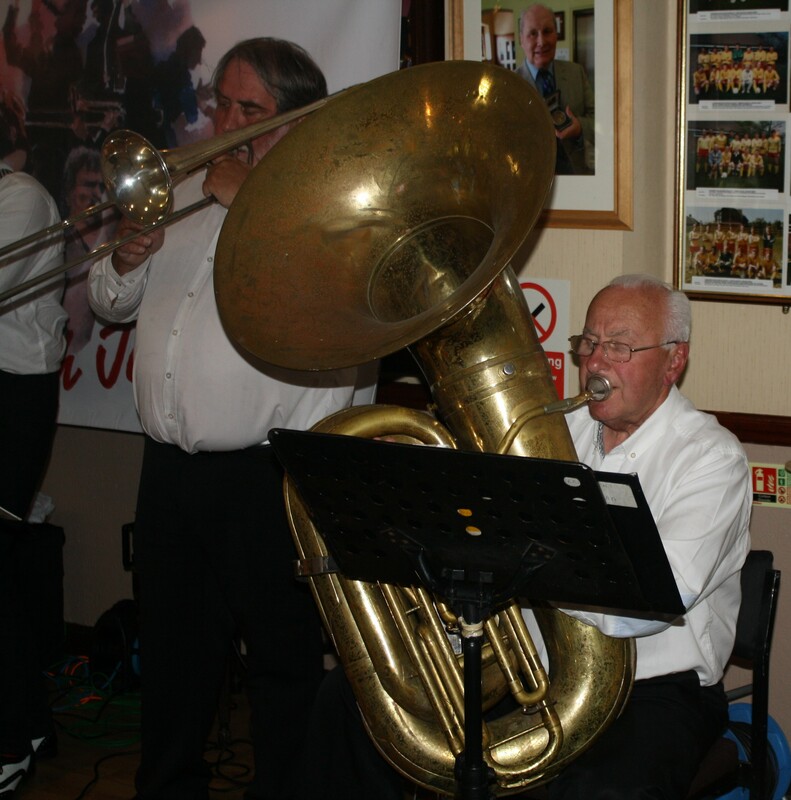 Nick Singe (banjo), Graham Wiseman (trombone) and John Arthy (tuba). 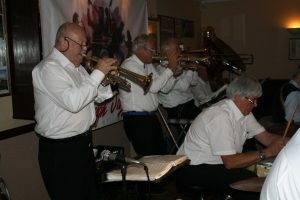 Photo by Mike Witt. 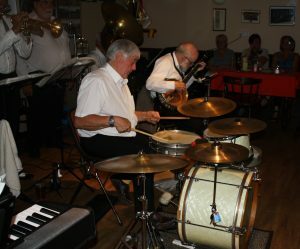 Graham Wiseman (trombone) and John Arthy (tuba), just two of the eight musicians in the ‘Yerba Buena Celebration Jazz Band’ seen here at Farnborough Jazz Club (Kent) on 26th June 2016. Photo by Mike Witt. 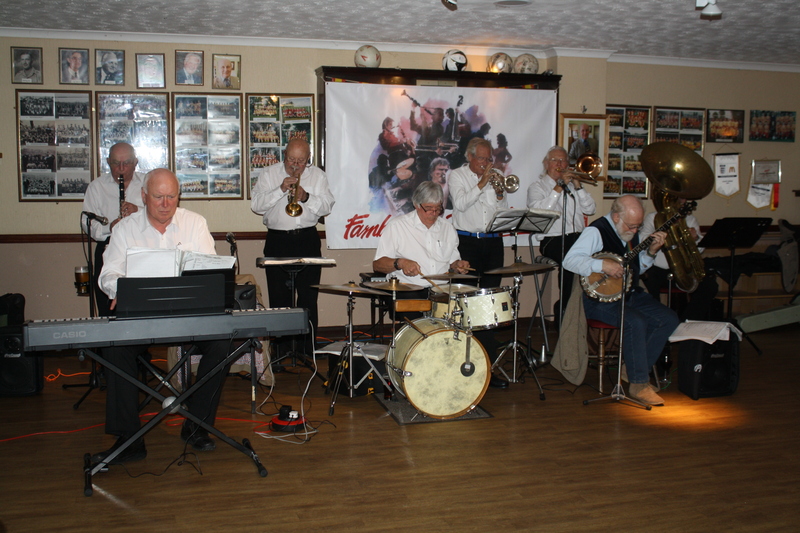 Yerba Buena Celebration Jazz Band seen here at Farnborough Jazz Club (Kent) on 26th June 2016. 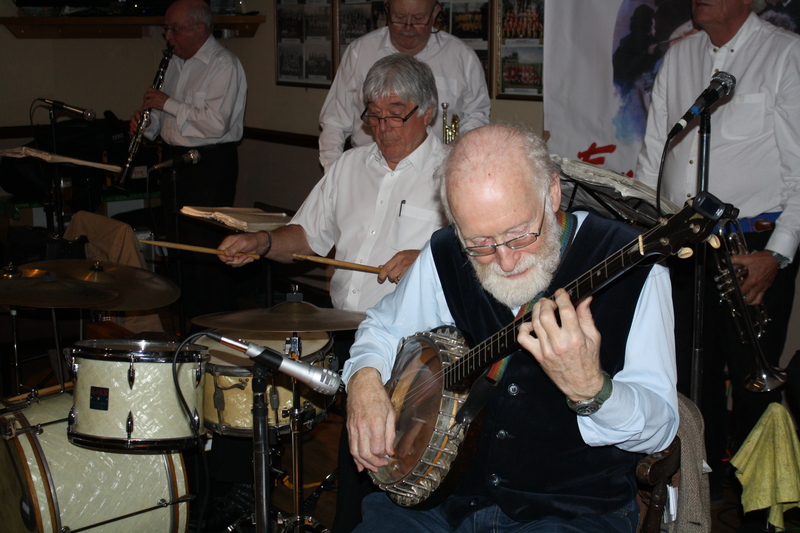 (front row LtoR) Hugh Crozier (piano), Pete Lay (drums) and Nick Singer (banjo). 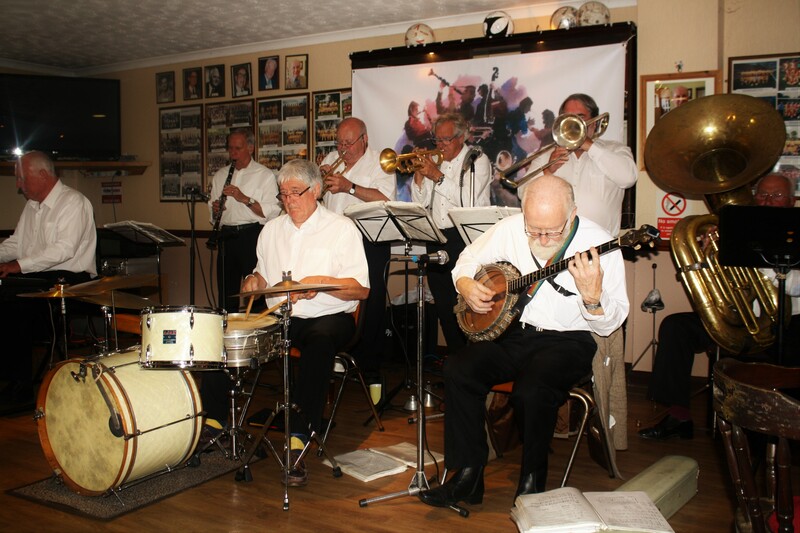 (Back row, LtoR) Goff Dubber (clarinet),Mike Barry (2nd trumpet &vocals), Dave Rance (1st trumpet &vocals), Graham Wiseman (trombone) and John Arthy (tuba). Photo by Mike Witt. Yerba Buena Celebration Jazz Band seen here at Farnborough Jazz Club (Kent) on 26th June 2016. 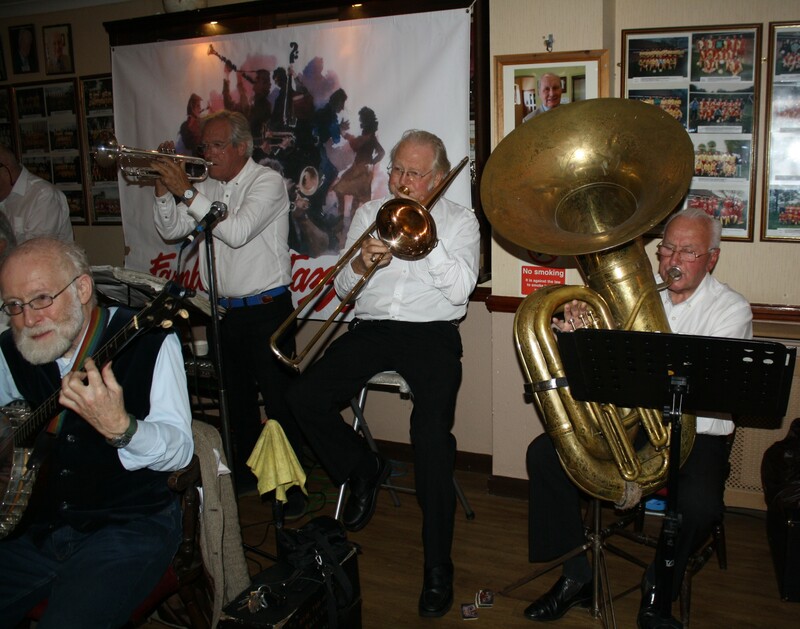 (LtoR) Dave Rance (band leader, 1st trumpet &vocals), Graham Wiseman (trombone), John Arthy (tuba) (front) Pete Lay (drums) and Nick Singer (banjo). (also pictured – wives Barbara Barry, Heather Lay and Sue Wiseman). 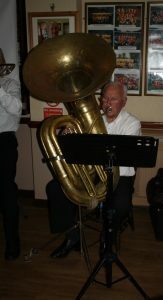 Photo by Mike Witt. 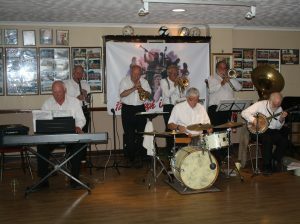 Band leader Dave Rance (1st trumpet &vocals), plus Pete Lay (drums), Graham Wiseman (trombone),Graham Wiseman (trombone), John Arthy (hidden by his heavy tuba) and Nick Singer (banjo), 5 of the 8 musicians in the ‘Yerba Buena Celebration Jazz Band’ seen here at Farnborough Jazz Club (Kent) on 26th June 2016. Photo by Mike Witt. This entry was posted in Yerba Buena Celebration Jazz Band on June 28, 2015 by Diane.